Cryoablation is a minimally invasive treatment procedure performed for cancer control. 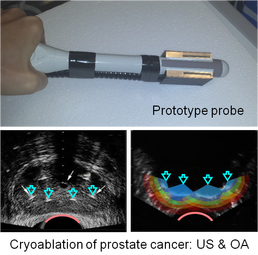 It is guided by a transrectal ultrasound by a physician who precisely positions transperinial cryoprobes near the lesion. The treatment involves multiple cycles of quick freezing at the cryoprobe tips followed by longer thawing. 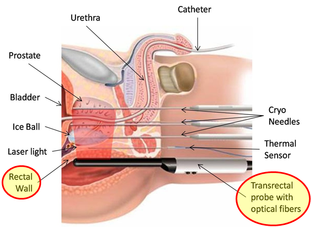 A warming catheter prevents urethra from damage. Closest to the probe, rapid cooling results in intracellular ice formation, damaging cells and resulting in immediate cell death. Cryoablation also damages blood vessels resulting in platelet deactivation, thrombosis and ultimately ischemia after reperfusion. Temperature mapping near rectal wall allows for real time temperature monitoring for ensuring safety and efficacy during the procedure.